You may have heard that we will be having another bout of Olympics this year. Yup, it's the year of the Winter Olympics and it will be hosted by none other than South Korea. As you probably know, it's a pretty huge event, which attracts mind-boggling amounts of people and needs tons of funding in preparation for the influx of sports teams and observers alike. With South Korea as the host this year, you can be sure that Samsung is among the main partners for the event! 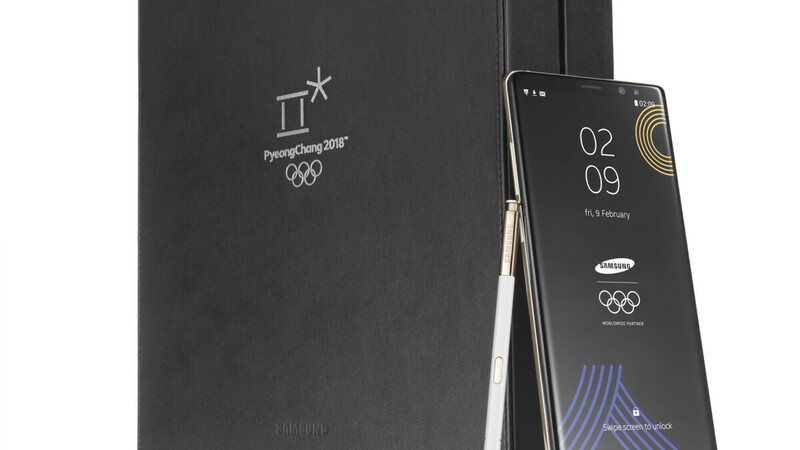 So, Sammy will be welcoming all the Olympians as well as the supporting staff that is working tirelessly to make this event happen by giving them all the gift of Note — more than 4,000 exclusive Galaxy Note 8 phones will be given to the PyeongChang 2018 Olympic family. What sets this limited edition Note 8 apart is the fact that it has a white back with gold accents and the 5 Olympic rings stamped on the handset's back. It's also pre-loaded with thematic wallpapers and a suite of apps that will be useful to the recipients. The handset will likely not be available for sale, unless some of them leak out to the second-hand market. The Paralympians at the Paralympic Winter Games PyeongChang 2018 will also get their Galaxy Note 8 phones, paired with cases that feature the Paralympic Games logo. Some OEMS only take, but this one just keeps on giving the gift of giving. This is by Samsung is where they are. Give even when others try to take away from you. Just be you and let them be who they will be. Best non-greedy company in the world. Great jobs Samsung! and Thank you for supporting these young talents athletics around the world. Best wishes to these Olympians and Samsung. It's part of Samsung's many marketing campaigns, and here you act as if Samsung is a charity organization. If they're all about helping people, they would donate these to poor people, not athletes. Ffs, for once, stop sucking their D.
Agree with you. It's called "marketing"....not "charity". I didn't expect a serious reply man. OMG, there is my white note 8 My favorite color, but I want silver trim not gold. Wow beautiful color!! We need more white phones!! Best phone in the world for the best athletes in the world. Fitting.